The couple that rides together, stays together. All is right in the drama world because our beloved Shan-Teng is back together! And to reward us loyal viewers for suffering through three whole episodes of them being apart, this entire episode was the drama equivalent of puppies playing in fresh snow. Or a kitten getting tangled up in yarn. Or…you get the picture. In one word: CUTE! Shan Shan runs into Zhou Xiao Wei in the Windgroup elevator, and thanks her for donating blood to her when she was in the hospital. Zhou Xiao Wei is her usual haughty self and tells Shan Shan that she’s wrong in thinking that she was recruited to join Windgroup to donate blood to only Feng Yue. Instead, she’s there on standby for Shan Shan too. When she donated blood to Feng Yue during her miscarriage, she only received a check from Feng Teng as compensation. He told her during the company party that he hired her for any medical emergencies with Feng Yue AND Shan Shan. As she leaves the elevator, Zhou Xiao Wei says that she heard Shan Shan hurt her leg during the company excursion. Don’t lie to me, Zhou Xiao Wei. Shan Shan is in complete shock to find out this information, and she goes to her usual balcony spot . She thinks to herself that if what Zhou Xiao Wei said was true, Feng Teng was already looking out for her before they even started dating. Shan Shan calls him to ask him about it, and he confirms that it’s all true. When she hurt her leg, he was extremely worried and finally understood why his grandfather had a tendency to hire people that had that rare blood type. Feng Teng tells her that she and Feng Yue are the two most important people in his life, so obviously he needed to do whatever possible to help them. Feng Teng is standing by the two-way mirror in his office and looking out at Shan Shan on the balcony. He asks her to promise him that she’ll stop changing herself for him, and wishes that she will always remain the Shan Shan who eats her lunchboxes out on the balcony. That’s the version of Shan Shan that he loves. Omg, heart melt! Hearing him mention her eating on the balcony, Shan Shan quickly looks around to see if he’s there. When he’s nowhere to be seen, she asks him how he knows about her and the balcony. Feng Teng brings Shan Shan to his office and shows her the two-way mirror. How did Shan Shan not realize before that his entire office wall is a window…? Story time! He tells her that he always ate his lunch here and one day, a random girl stumbled onto his balcony to eat her lunch. Sometimes he saw her smile, and sometimes he saw her cry. Over time of watching her, she eventually found her way into his heart. He wondered to himself when he and that girl would be able to eat together without the piece of glass between them. That love confession…bravo, Feng Teng. You win everything. He tells Shan Shan that from now on, they can eat lunch together here. Shan Shan, however, is still hesitant and tells him that she might never be able to have children. Feng Teng asks her if this is why she was so determined to break up with him. She says that he’s the only son in the Feng family, so it’d be selfish of her to just get back together with him when they might have this obstacle in front of them. Feng Teng tells her that with him taking care of her, there’s absolutely no way that she wouldn’t be able to have kids. With that sweet reassurance, Shan Shan asks him if she can continue to eat her lunch here and he tells her of course. Shan-Teng <3. Liu Liu, Shuang Yi and their boyfriends are at Shan Shan’s place to celebrate Shan-Teng’s reconciliation. As the crew is throwing back a few drinks, Feng Teng advises Shan Shan to not drink so much. But when she ignores him and is about to take another drink, he takes the bottle away to drink it for her. Randomly out of nowhere, Liu Liu’s douchey boyfriend snatches the bottle away from Feng Teng and says that he’ll drink it for him since Feng Teng needs to drive. But because he can’t help but look like a complete jackass, he then hands Feng Teng a business proposal and eagerly tells him that he wants to work with him. By the look on Feng Teng’s face, he most definitely doesn’t want to work with that guy. Thanks to him, the whole mood of the dinner is ruined. Drink up, everyone. Yan Qing and Zheng Qi tells Shan Shan and Feng Teng the next day to tell them that the company’s lawsuit has been successfully defeated. Thank god because it was legit the plot that wouldn’t go away. They found out that the company who was suing Windgroup bought a used computer from some dude in Seattle a couple year ago. Turns out that the dude who sold the computer is Zheng Qi’s cousin. Oops. The rival company was then able to retrieve the deleted files from the computer that had Zheng Qi’s work for the Windgroup app. So the entire lawsuit was a sham, and now Feng Teng is determined to fight that company in court until they disappear from the business world. Someone’s feeling vengeful. Everyone decides to celebrate the end of the lawsuit and of course, Shan-Teng’s reconciliation. So what do these fancy schmancy people do? Ballroom dance at the Fengs’ mansion, duh! Seriously…this group sure loves dancing. The three main couples are waltzing and tangoing away, and Shan Shan is showing that those dance lessons didn’t go to waste. While they’re dancing, Zheng Qi and Li Shu are all loved up, and he tells her that no one dances better than her. Bleh. She responds that she was so stupid before for trying so hard to get Feng Teng’s attention when there was already someone who treated her like a treasure. It’s always about you, Li Shu, isn’t it? So you think you can dance? Nope. Later during the dance party, Yan Qing tells Shan Shan that he and Feng Yue are really happy that she’s back with Feng Teng. He says that Feng Teng is a pretty perfect boss and brother, and he’s confident that he will be a good boyfriend too. He also asks Shan Shan to call up Liu Liu to meet with him and Feng Teng because they want to discuss that business proposal with her. 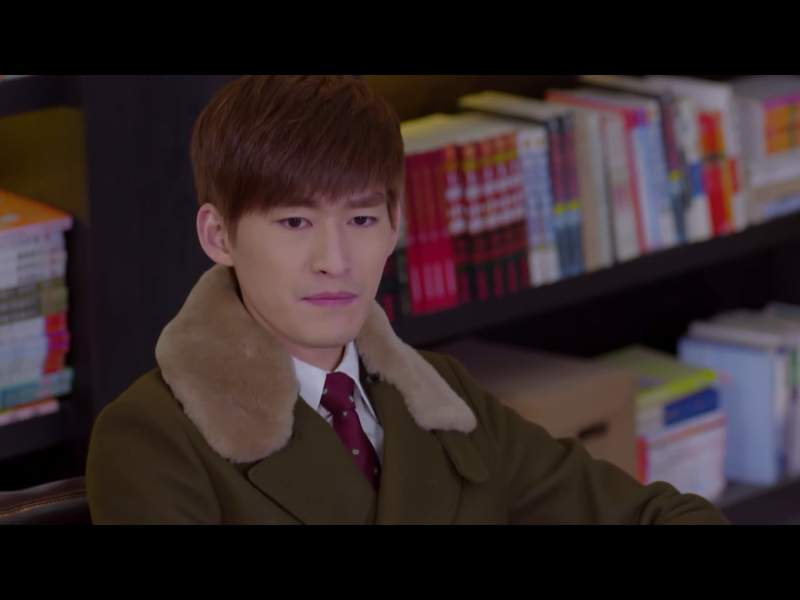 Yan Qing makes sure to tell Shan Shan to not invite Liu Liu’s boyfriend. Word. No one wants that guy around. At the meeting, Feng Teng tells Liu Liu that he figured that she wrote this proposal, and not her boyfriend. He was really impressed by it and wants to invest. Feng Teng tells Liu Liu that he, Yan Qing, and Li Shu have agreed to invest in the company…but only if Liu Liu is the one in charge. Liu Liu tries to tell him that she’s not experienced enough to take on this project, but Feng Teng insists that this is the only condition he has for investing. He couldn’t care less what her boyfriend’s role is in this project, or if he’s even involved at all. Liu Liu tells him he understands. That night, Shan Shan tells Feng Teng that he doesn’t need to invest with Liu Liu’s company just because she’s her cousin. He says that he is actually interested in her business proposal, and he also knows that if it’s a success, it’s a win-win for both of them. He would be able to make money, and Liu Liu would be able to escape from under her boyfriend and mother’s shadows. Shan Shan is still worried about all the money that they’re investing, but Feng Teng reassures her that if they do end up losing money, he’s going to keep Shan Shan as a repayment. Shan Shan says she didn’t know she was so valuable, and he tells her that she’s priceless. Too cuuute. Shan Shan, Feng Teng, Li Shu and Zheng Qi are all out biking together, and Shan-Teng is wearing matching sunglasses! Keep it comin’ with all this adorableness, please. Later, Li Shu finds out that Zheng Qi’s phone was ringing off the hook because he was getting text messages from a bunch of different girls. Obviously, she gets jealous and demands to know why these girls are still texting him in that flirtatious tone. She finds out that Zheng Qi never told them that he has a girlfriend now, and she says that he must want to keep his options open. She storms off, and Zheng Qi surprisingly doesn’t chase after her. After hearing about Li Shu and Zheng Qi’s fight, Shan Shan takes the opportunity to ask Feng Teng about his own relationship history. He didn’t want to say at first, but Shan Shan insists that she tell him since it was such a disaster when he didn’t tell her about Li Shu before. He ends up telling her that he had two previous girlfriends. One was an heiress to a big corporation and the other was a famous movie star. Shan Shan gets a little self conscious after hearing that Feng Teng’s exes were such impressive women. Girl, they ain’t got nothing on you. He asks her about her relationship history, and Shan Shan cutely tells him that she already told him that he’s her first love. Feng Teng still asks her who are the guys she had crushes on before, ya know, besides Zheng Qi. Shan Shan asks him why he’s assuming it was always her who liked the guy, and why doesn’t he ask if there were any guys that liked her. Feng Teng smiles to himself, and says he really doesn’t have any interest in knowing and runs off. While Shan Shan is studying that night, she finds an envelope tucked away inside her textbook. When she opens the envelope, there’s a love letter! What a coincidence after today’s conversation. She shows Feng Teng the letter and insists that she’s innocent because she’s never flirted with any boys in her class. He reads it with an amused look on his face, and asks how she knows that the letter is for her since it wasn’t addressed to anyone specific. She says that of course it’s for her since it was in her textbook. When he asks her what she plans to do about the letter, Shan Shan says she’s just going to ignore it. Feng Teng tells her that based on his own experience, if she ignores the letter, then they’re just going to keep coming. Shan Shan pouts and says that he must have a lot of experience then. Feng Teng tells her to confront the guy about it, and also to ask him what it is about her that he finds so attractive. This is a question that he’s wondered to himself for a long time. Feng Teng, you jokester. Shan Shan asks him how he feels about her receiving a love letter, and he responds that Shan Shan is all grown up now. When she pouts some more over his response, he tells her that she’s all his. Heart melts forever. At her CPA class the next day, Shan Shan finds the guy during the break and tells him that she got his letter and read it. The guy is all rude and asks her how the letter ended up in her hands. Turns out the letter was meant to go to the shady girl who sits next to Shan Shan. The guy insists that he definitely placed it under the textbook on the shady girl’s desk. Psh, as if Shan Shan would want a love letter from this guy when she’s got Feng Teng. When she meets up with Feng Teng later, Shan Shan tells him that the letter wasn’t meant for her. Feng Teng figures that if the guy wasn’t lying about putting the letter under the shady girl’s textbook, then it must be the shady girl who put it inside Shan Shan’s textbook. Neither of them can figure out why she would do that though. But right on cue, shady girl calls Shan Shan to “apologize” for putting the note inside her textbook. And when she hears that Shan Shan and Feng Teng are at the nearby coffee shop, she says that she’s on her way. No love rivals for FT.
Shady girl tells them that she assumed the love letter was meant for Shan Shan since she’s apparently so close with that guy. Shan Shan’s all like wth, I don’t think I’ve ever talked to that dude. Feng Teng, in the meantime, is playing dumb and pretends that he never even heard about this letter business. Shady girl’s eyes are glued on Feng Teng the whole time and trying to put the moves on him. She’s pretty much the definition of thirsty. Shan Shan sees through her game and immediately grabs onto Feng Teng, literally, and acts all lovey dovey with him. She rejects shady girl’s offer to take them out for dinner, and wishes her and love letter dude a happily ever after. Bye, shady girl. In the car, Shan Shan pouts and blames Feng Teng for flirting around. He’s finding all of this hilarious, and says that it’s her own fault for not being more aware. Shan Shan thinks back to how shady girl was always asking her about Feng Teng, and realizes that she was after him this whole time. She can’t believe that even at her CPA class, she’d find a love rival. You just know that Feng Teng is lovin’ all of this. The group goes to some type of countryside villa/vineyard type place without Zheng Qi because he and Li Shu are still fighting. They tell her that he’s at Windgroup working so he definitely won’t show up on their excursion. But of course, right when they get to the villa, Zheng Qi is standing there with a bunch of random stuff. Zheng Qi tells Li Shu that this is all the crap that his old flames gave him, and he’s going to burn it all in front of her. Li Shu plays hard to get and is walking away. Zheng Qi calls out to her and asks her to marry him! Haven’t they been dating for like…two weeks? I guess when you know, you know. After finding out that Feng Teng was watching her out on the balcony, Shan Shan wonders if she did anything super embarrassing out there. She asks Feng Teng if he could hear what was said out there, and he says no, but he did hire a teacher to teach him how to read lips. He tells her that he only needed two lessons before he had won her heart. This comment earned a proper eye roll from Shan Shan, ha. At the Feng mansion dance party, Shan Shan asks Feng Teng if he purposely suggested for them to dance because he wanted to see her make a fool of herself again. He says that he knows she can dance now, and Shan Shan figures out that he saw her text message with her dance instructor. She tells him that not only is he spying on her on the balcony, he’s going through her phone too. Feng Teng protests that it was all done out of loveee.